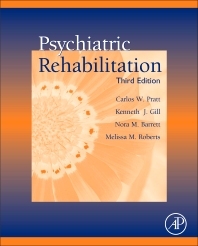 The third edition of Psychiatric Rehabilitation, discusses interventions to help individuals with mental illness improve the quality of their life, achieve goals, and increase opportunities for community integration so they can lead full and productive lives. This person centered approach emphasizes strengths, skill development, and the attainment of valued social roles. The third edition has been fully updated with new coverage indicating how to address medical problems while treating for mental illness, wellness and recovery, evidence based practices, and directions for future research. Retaining the easy to read, engaging style, each chapter includes key terms with definitions, case studies, profiles of leaders in the field, special issues relating to treatment and ethics, and class exercises. Providing a comprehensive overview of this growing field, the book is suitable as an undergraduate or graduate textbook, as well as a reference for practitioners and academic researchers. Carlos W. Pratt, PhD, CPRP, is Professor, and Director of the PhD Program in Psychiatric Rehabilitation, Department of Psychiatric Rehabilitation and Counseling Professions, School of Health Related Professions, Rutgers, the State University of New Jersey. The program he helped establish and directs is the first to offer the doctoral degree in this emerging field. He completed his BA at Glassboro State College in New Jersey and his MA at Teachers College, Columbia University. After many years providing services for persons with severe mental illness he completed his PhD at Hofstra University. In addition to numerous conference presentations and book chapters, he has authored articles in Journal of Psychosocial Nursing, Occupational Therapy in Mental Health, OT Practice, Psychiatric Rehabilitation Journal, Community Mental Health Journal, Psychiatric Rehabilitation Skills and Rehabilitation Education. He is a Commissioner of the Psychiatric Rehabilitation Association, Certified Psychiatric Rehabilitation Practitioner (CPRP) Commission and a past President of the New Jersey Psychiatric Rehabilitation Association. Nora Barrett is an Associate Professor in the Rutgers Department of Psychiatric Rehabilitation and Counseling Professions and Director of the Bachelor of Science Degree program in Psychiatric Rehabilitation and Psychology. She is responsible for overseeing the program’s curriculum and ensuring that it reflects current best practices in the field. She has more than 20 years of experience teaching psychiatric rehabilitation courses. She frequently presents at conferences, provides consultation and training on topics such as individualized recovery planning and ethical practice, and has published a number of articles. She has served on the Board of the United States Psychiatric Rehabilitation Association and its New Jersey affiliate, NJPRA. She is also a founding member of the Consortium of Psychiatric Rehabilitation Educators. She is an active advocate for recovery-oriented services and the credentialing of psychiatric rehabilitation providers. Professor Barrett also worked for more than a decade as a direct practitioner, clinical supervisor and mental health administrator. Melissa M. Roberts, PhD, CPRP is a Professor and Director of the Integrated Employment Institute (IEI) in the Department of Psychiatric Rehabilitation and Counseling Professions at Rutgers, The State University of New Jersey. As Director of IEI she oversees the development and delivery of training and technical assistance designed to improve employment services for people with psychiatric disabilities. Additionally, she teaches graduate and undergraduate courses in career services, organizational management, and supervision. She has presented workshops and trainings at conferences throughout the United States and in Canada and Europe. Dr. Roberts has extensive experience in the development and delivery of exemplary services. She has provided training to hundreds of service providers, consumers and families. Dr. Roberts is a recipient of the NJ APSE Rebecca McDonald Leadership Award, the NJPRA Mort Gati Award for a career that exemplifies the principles of psychiatric rehabilitation, and the UMDNJ Excellence in Research award.